Provide comfort for the family of Maria Valdez with a meaningful gesture of sympathy. 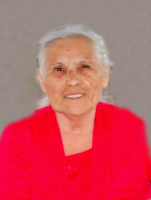 Maria is survived by her children, Jose LeRoy Valdez, Alex Ruben Valdez, Jr.; sister, Corrine Saiz; grandchildren, Doris Rodriguez, Theodore Joseph Valdez, Jr., LeAnn Valdez, Mary Valdez, Isaac Maestas, Wanda Jaramillo, LeRoy Valdez, Jr., Jeremy Valdez, Robert Valdez, Jonathan Valdez, Michael Valdez, Jared Valdez, Ruby Hoover, Alex Valdez III, Ryan J. Valdez; and numerous great-grandchildren and great-great-grandchildren; and special caretaker, Rafael Rodriguez-Mata. Funeral service will be Saturday, March 23, 2019, at 10:00 AM at Garnand Funeral Home Chapel in Ulysses with Pastor Nasario Navarette officiating. Interment will follow at Ulysses Cemetery. Visitation will be Friday, March 22, 2019, from 10:00 AM until 8:00 PM at Garnand Funeral Home Chapel in Ulysses, with an evening service at 6:00 PM. Memorial contributions may be given to Maria Valdez Memorial Fund in care of Garnand Funeral Home, 405 W. Grant Ave, Ulysses, KS 67880. To plant a memorial tree in honor of Maria Efren Valdez, please visit our Heartfelt Sympathies Store.